If you've decided to take your home exercise program to the next level, you may be thinking about buying one of those sleek indoor cycle bikes you've used at your health club. But, are they all the same? What should you look for? Like all other types of exercise equipment, indoor cycle bikes come in a wide variety of price ranges, features and quality. As the old adage goes, You get what you pay for. Bikes differ significantly from basic stationary cycles and are generally designed to take sustained abuse by serious fitness fanatics. Some good examples of entry level indoor rigs are the Stamina CPS 9200 Indoor Cycle, the Yukon HIGOL STD-38 and the Mileage SP-08 Training Bike. As of 2009, these bikes range in price from $400 to over $1,000 and are available at American Fitness Exercise Equipment. Brands Cycle offers a complete line of high performance indoor bikes. At the low end, the Lemond Fitness RevMaster Sport uses a Kevlar belt instead of the traditional chain drive that results in a smoother, quieter drive, classic-style handlebars, adjustable floor levelers, micro-adjustments for the handlebars and seat post, an anatomically designed saddle and transportation wheels to make moving the RevMaster easy. The RevMaster costs $900. 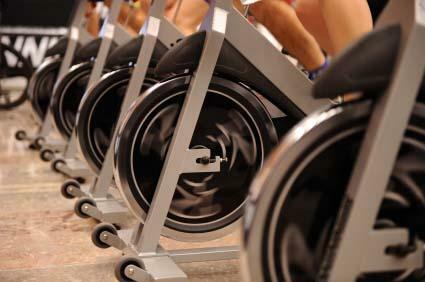 Their top-of-the-line indoor bike is the CycleOps Pro 300PT Indoor Cycle. The CycleOps costs $1,800 (as of 2009), is designed for serious athletes and features power readings that are accurate to within +/- 2 percent, a 48 lb. flywheel and a USB connector that makes it a snap to download performance data to your PC. When you and your family need the kind of durability and performance from an indoor bike that can stand up to constant abuse, consider buying a commercial bike. While they may significantly deplete your bank account, you'll get the best that money can buy and features that typically aren't available with other, less expensive models. For instance, the eSpinner, will cost you around $4,400 but it includes an integrated touch screen computer with a digital TV tuner, headphone and iPod jack, onboard cycling classes, motivational coach and dual-sided, SPD-compatible pedals, so riders can wear either regular fitness shoes or clipless pedal cleats. Keeping your fitness program alive by using one of the bikes described above can be an easy, yet challenging way to stay fit. So, clear out that spare bedroom and get ready to put in some serious mileage!